1. 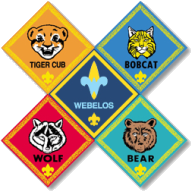 The race is open to all Cub Scouts registered in this Pack. Siblings and friends may also enter in a seperate division. Leaders and parents will make up the third division. Kits can be purchased at our local scout shop.